The ultimate PokÃ©mon battle is about to begin... At long last, all of your favorite PokÃ©mon are ready to go head-to-head on the N64! Whether you're battling a friend, a Gym Leader or a tournament contestant, you're about to witness some of the most spectacular battle scenes in PokÃ©mon history! Select a team from a huge stable of "rental" battlers, or use the included N64 Transfer Pak to upload your own team of PokÃ©mon Red, Blue or Yellow! This Stadium is packed and ready to rock! 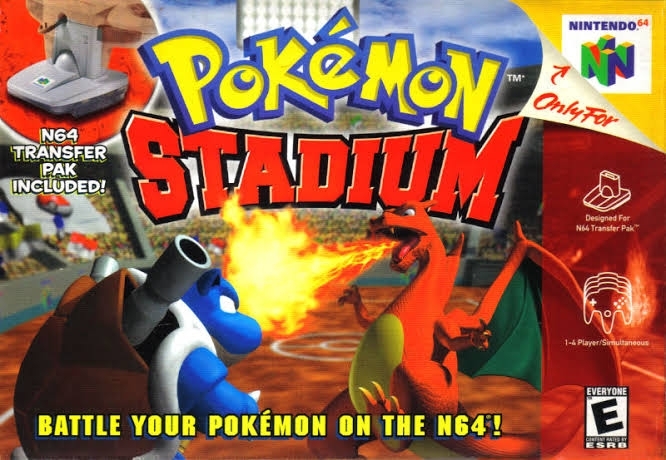 â€¢ Awesome 3-D animation on the N64 makes all 151 PokÃ©mon larger than life! â€¢ Use the N64 Transfer Pak to battle using your PokÃ©mon from Red, Blue or Yellow. â€¢ Battle your way to the top of the championships, or have a free-for-all with up to four players! â€¢ Nine Mini-Games add to the multi-player fun! â€¢ Use the power of the Transfer Pak and the N64 to play the PokÃ©mon Game Boy game on your television!